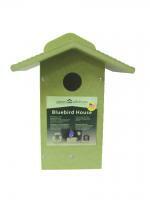 With their distinctive blue plumage and sonorous chirping, bluebirds are a favorite of many birdwatchers. A bluebird feeder will not only liven up your backyard, but will also help revitalize the bluebird species, which has depleted significantly over the past few decades due to competition from the house sparrow and other birds. 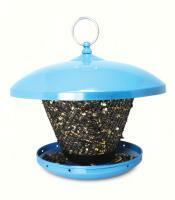 Our bluebird feeder collection primarily features platform feeders that dispense mealworms, as bluebirds don't eat birdseed. 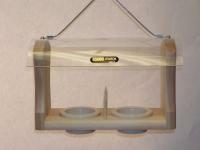 A bluebird feeder will usually have holes sized specifically for bluebirds, in order to prevent larger birds and other predators from gaining access. 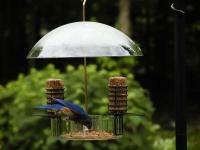 Pick out a bluebird feeder today and with our lightning-fast shipping your yard will be flocked in bluebirds in no time. Good quality. Easy to fill. Can easily fill with different feed. And the birds love it! I love these feeders. 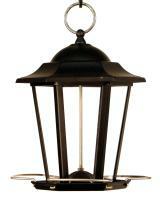 They hold up very well and are easy to fill. 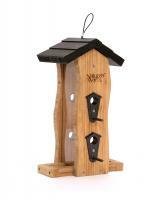 I've bought the feeders for myself and now I give them as gifts. I like the fact that they are clear so you can easily see when they need to be refilled the birds love them and so do we. 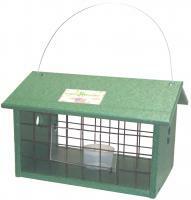 I bought one of these last year to feed dried mealworms to the bluebirds. 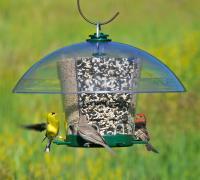 They love these feeders! 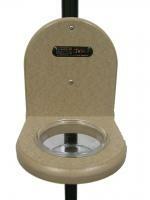 It is excellent quality, easy to clean, and durable. 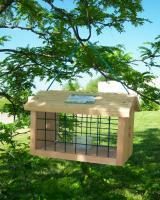 That is why I ordered another one this year so the bluebirds would have the convenience of 2 feeders! I highly recommend this product!!!! Great customer service as well! 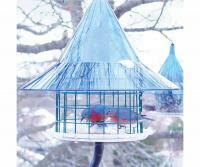 This is a wonderful little bluebird feeder and my bluebirds had no problem coming to it. 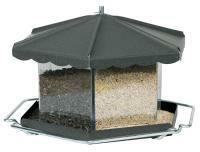 I purchased it because I was having a problem with starlings keeping the bluebirds away and eating their food. Well, the starlings had no problem hanging on to this feeder either! 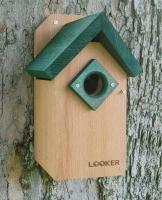 So it did not work for me, although the bluebirds loved it when they could get to it! If you don't have a starling problem, then I would highly recommend it. 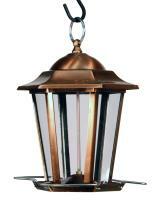 The item itself is great, being recycled and such. Unfortunately my bluebirds haven't touched the feeder (I had to put my half rotted wood one back up) and the starlings can get to the food since the distance from hole to bottom is shorter then at my old feeder. At this point I can't use it for what it was intended. 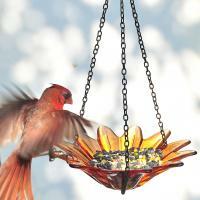 How to Attract Birds With Mealworms - Using mealworms will attract different types of birds to your yard other than those who eat bird seed. 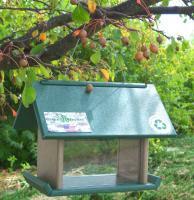 Since mealworms require more work, here are some tips and suggestions for attracting birds with mealworms. 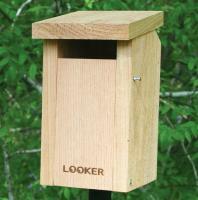 Monitoring your bluebird nest box - Monitoring your bluebird nest box is crucial. 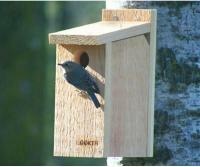 Learn how to monitor and observe your bluebird nest through the stages of courtship, incubation and birth. 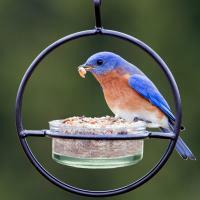 How to attract bluebirds to your yard - Learn the keys to successfully attracting bluebirds to your yard, such as nest box placement, how to avoid pests and other ways to cultivate a welcoming environment for bluebirds. An introduction to bluebirds - The bluebird is popular among bird lovers because of its gorgeous plumage and melodious song. 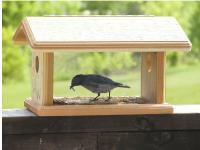 How to protect bluebirds from house sparrows - House sparrows not only occupy empty bluebird nesting boxes, but they also storm occupied boxes, killing adult bluebirds and nestlings. 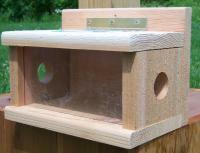 Attracting Bluebirds to Your Bluebird House - one of the most utilized nesting locations for bluebirds is the man-made bluebird boxes that mimic the natural cavities found in dead and decaying trees.